I want to mention and thank our visiting professional teachers who have graced us with their presence. First and foremost our great Peter Sanson who teaches with dedication to the traditional method of Ashtanga with great purpose and energy. We are very blessed to have him come and teach at our shala. Also to Kiri Sutherland and this year for the first time Stephanie Nelson, two Ashtanga teachers with utter dedication also and great skill in imparting technical information. We are lucky to have you come to us. To Pragyadhara who has given some beautiful workshops in the more subtle tools of yoga with chanting and meditation. To Maureen Mckain for her Gong Bath Concerts, thank you. Thank you everyone for your continued support of Sun Salute and Hearth Grocer this year. We really are blessed and I know we all love this place and enjoy the space to practice in very much. I reflect on this a lot, especially since life has gotten so busy this year. That I can come to practice this craft in the very place I work and interact with such good people must be a stroke of exceptional good luck. So thank you again and I hope you have a very happy and relaxed Xmas summer break. I’d like to take this opportunity to list through the teachers, helpers and collaborators at Sun Salute, to thank them and to tell you just how great they are. 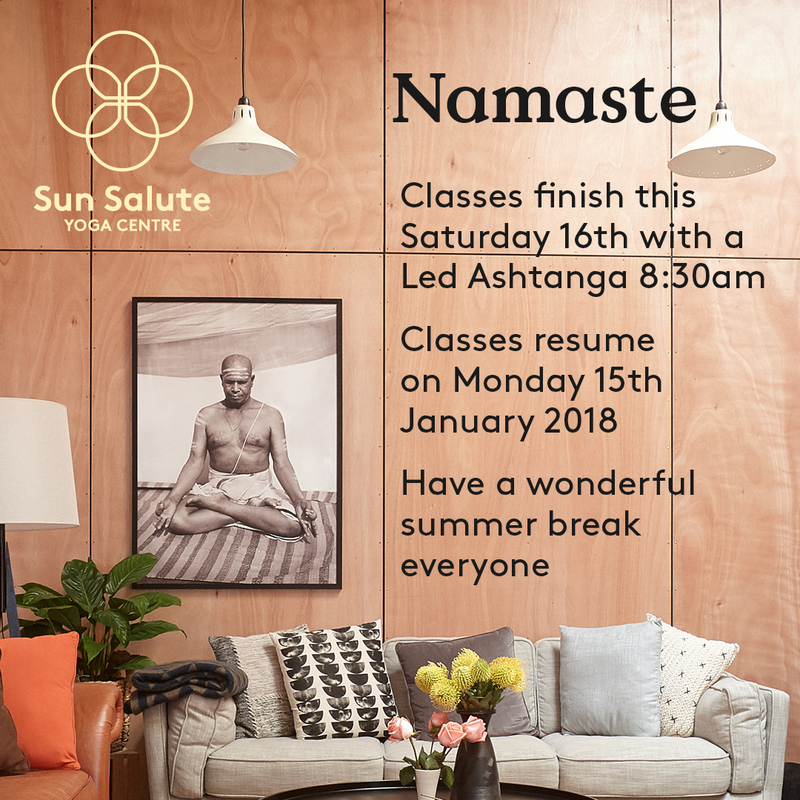 Peter is a founding teacher of Ashtanga yoga in Hamilton, and we can only be thankful he is a mainstay of Sun Salute. He is humble, kind and visionary and we love his silver hair and brilliant smile. Pete had what can only be called a ‘health scare’ this year (which scared us all as he is one of the healthiest individuals we know). In typical steady and patient fashion he got through and is back on the track, teaching and practicing again and quietly tilling the ship with his support and wisdom. You are amazing Peter. Dee cleans the entire studio from top to bottom every Tuesday with the passion and determination that only a person born under the sign of Virgo could have. It not only satisfies her high standards of order and style but she does it infull support of the place she loves. I am always floored by how freely she supports and gives, and always without a care in the world. Dee loves yoga and teaching yoga as much as she loves her horses and the shores of Raglan and her feline friends. She is a dedicated professional who is great to work with. Love her to bits. Kay could not be kinder, gentler, more thoughtful, nor more busy! Not only does she teach yoga at Sun and in Raglan, but she travels the country as a free lance photographer and creates unique leather-work art and upholds commissions from all over the Southern Hemisphere. Kay’s passion to dig the depths of art, philosophy, nature and humanity is clearly evident and very inspiring. She is a delight to know. Along with Kata, I get more cries and sighs of adoration for this woman’s teaching than anyone else. Victoria’s sensitive manner and gentleness and ability to be present are much needed in this world and wherever she goes she leaves a stream of loving compliments in her wake. Through some troubling times this year, Victoria has upheld the intention and dedication to teach with great grace and purpose. Super thankful. Kata took on a full time job this year at Wintec, and it was our loss. She is so popular at Sun, I think she could pretty much run all classes on her own and the place would thrive. Her accent, her smile, her hair! But above all her sense of calm, love and intent for good and truth shine so brilliantly it is hard not to be dazzled in her presence. Also through tough times Kata has continually turned up and produced beautiful classes, late into the evening and Sunday mornings, with full commitment and care. Thank you Kata. Sabine rose up like a veritible Lazarus this year. She is a well travelled and versed student of ancient India and yoga and has become a super busy massage therapist and yoga teacher. She pieces together a Hamilton and Auckland schedule of work and meditation retreats in Australia with dedication and consistency. She has a great sense of fun and one of the brightest smiles you’ll see. Both things are never far from the surface and I suspect this is one of the delights of her classes. I especially value Sabine’s amiable nature and friendship and her beautifully penned emails. Never too many exclamation marks, always full of wit. I want to thank Tina for quietly and determinedly initiating some teaching opportunities at Sun Salute and in supporting us in assisting roles in the Mysore class. To Joel to I thank for bringing dedication and intent to teaching some kids classes and to helping me with Mysore practice and other kids classes too. Invaluable. Have all taught at Sun Salute with absolute professionalism and care. They have been great to work with and I appreciate them immensely. Sisters Vero and Marisol are moving back to their home country of Chilli. We will miss them very much. I can not say enough of Maureen’s presence at Sun Salute. Every single week flowers appear, often twice a week, all from her own garden, all done by Maureen. Every week the bathroom towels are done, come rain, hail or shine, by Maureen. And every week she gets to at least 3 classes, and puts half of us to shame with her steadiness, natural ability and dedication. Sometimes I look at her in class and my heart swells up with delight and inspiration. Maureen has got to be our pin-up girl for Sun Salute! She is not only fit and healthy and informed and current, she is friendly and sociable (a long black thank you Bruno, extra water), loving and kind and in touch with the things that matter. She is solid. She is free. We look forward to celebrating your 90th birthday next year Ms Mckain. April, of course. Thank you for all that you do and for inspiring us all. These people have all bought something to make this place great, enjoyable, attractive and clean! Deepa for her general loveliness and support, her organising of special Bhajan evenings and for gifting us the magnificent framed images (generously framed by Sarah Marston of The Framing Workshop in Silverdale) of the great yoga masters you see on the walls. Sarah also for initiating the instalment of the fan in the practice room, a gracious thanks. Carol and Manon have kept the babies and toddlers in line in the Mums n Bubs Classes. So good at it too and with much love and fun! Rosie for your shining presence and good advice. Tracey for your general effortless support at Hearth and with house keeping, thank you. This could beanother long paragraph, but I’ll keep itshort and sweet. You are the H Team Fergus, Manon, Abbie, Allison, Daniel and now Chrissy, Fox n Aleisha and I thank you for it. Fergus at the helm, you are very highly thought of, by many and all. It’s been a joy bringing the synergy of yoga and food to one centre. Thank you to everyone who supports us there in the myriad of ways. Our bookkeeper and accountant extroadinaire. Possibly impossible to operate without you now. A very big thank you. You both bring something very special with your healing skills and therapy to Sun Salute and I love working with you. Thank you. My husband Alan Deare and cat Saffie Maus. Thank you for lovingly bailing me out, listening to me and running down to meet me at the gate. All love, always.